The 1960s would bring about more firsts in the auto industry, most notablythe introduction of the first turbocharged engine in 1962, and in 1966 the tornado is introduced as the first modern front-wheel drive car produced in the United States. The 60s would also unleash two of America’s biggest car Icons to hit the road, the Cutlass and the powerful 442. The cutlass would go on to be one of the best selling cars Oldsmobile ever produced in the 80s and we will go over this in the 70s and 80s page. The 442 which stood for, 4-barrel carburetor, 4-speed manual transmission, 2-exhausts, but that definition was later changed to “4” hundred CID V8 engine, “4”-barrel carburetor, and “2” exhaust pipes was named by “Car Craft Nationals” as the “Top Car of 1965” (GM heritage center, 2014). 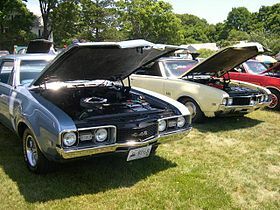 A major part of Oldsmobile in the 60s was the 442 and Oldsmobile’s market fight against Pontiac’s GTO and creating a legit muscle car from Lansing’s Oldsmobile line. The 442 was a quick response to the Pontiac Tempest GTO, an unexpected success in the 1964 model year. It was created by Oldsmobile engineer John Beltz. It became its own model and Oldsmobile’s signature muscle car from 1968 to 1971, then was moved back to a signature engine option in the mid-1970s; the 1969 model being the fastest doing 0-60 mph in 5.5 seconds (GM heritage center, 2014). 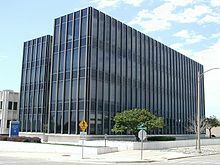 In 1965 Oldsmobile would begin to move its headquarters to Lansing as well as add another assembly plant to the main assembly complex in Lansing to handle Toronado production. 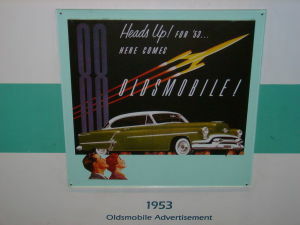 Employment at Oldsmobile in Lansing would top 15,000, and by 1966 Oldsmobile was once again completely in Lansing and thriving going into the 70s and 80s.